CLICK HERE TO RESERVE YOUR SESSION OR FIND OUT MORE INFO TODAY! Want the ultimate experience? This session is where we make your dreams happen! Full professional hair & make-up, 2 hours of “regular” senior portraits, plus MORE time for a conceptual, sports, or night shoot. There’s lots of options! We recommend the Lux shoot in particular for seniors who want to go to remote locations, use larger props (cars or motorcycles), or want to do more in-depth sports shots. We shoot a limited number of Lux sessions each month, so please book in advance! On-location session, with 3+ hours of shooting time! This is our most popular session for girls. Have a full hour of professional hair and make-up so you look absolutely fabulous, plus 2-3 hours of shooting time and unlimited wardrobe changes and locations. Perfect for the majority of seniors who want a variety of urban and natural locations, and a few specialized photos of sports or activities. Guys, you can choose this session if you’d like more sports or stylized shots and receive a small print credit in lieu of hair and make up. On-location session, with 2-3 hours of shooting time. This session features my signature shooting style – fresh, modern, and fashion-inspired. Included in this session is 1- 2 hours of shooting, and unlimited outfits and locations. We recommend this session for seniors who want to keep things simple but still have the JWP signature style. Most guys choose this session, though we recommend that if a senior guy would like stylized sports photos that you choose our Couture Session and we will apply a small credit towards your final order! *All prints and products are sold separately at your premier ordering session. Session fees are for the time and talent of your photographer only and does not include any physical prints, proofs, or products. CONGRATS!you've made it to yoursenior year! 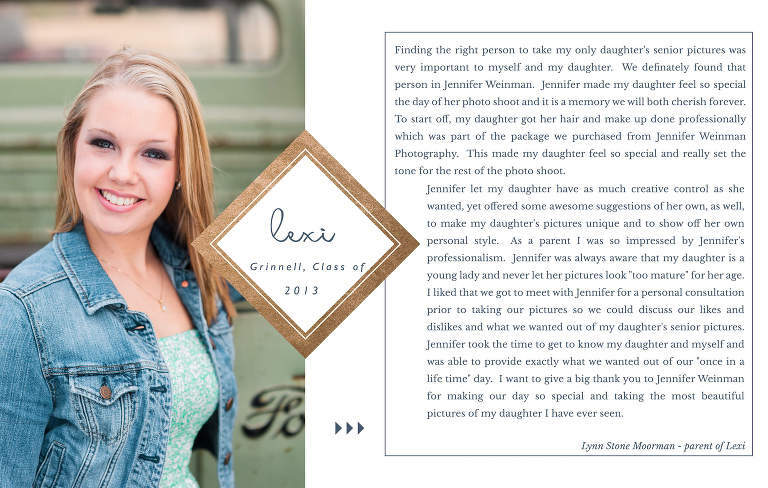 What better way to celebrate your accomplishments and passions than a truly customized senior portrait shoot! 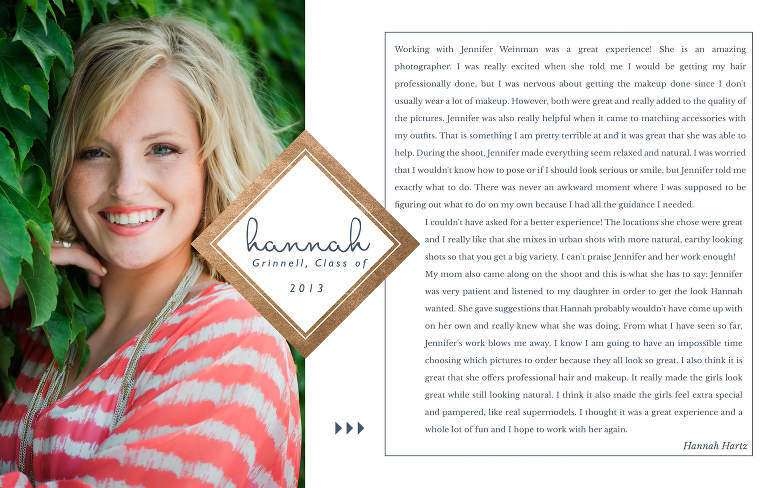 As a #JWPsenior, your session is a once-in-a-lifetime experience completely tailored to you. Yes, you get unlimited outfits and locations, but more importantly, you receive a couture photography experience that reflects your true beauty and personality - inside & out! The COUTURE session, my most popular senior portrait session, begins with professional hair design and airbrush makeup application. You choose the style you want - if it's dramatic and glam, we can do that! If it's more natural and understated, we can do that too! It's important that your styling showcases YOU, so I'll consult with you in advance to help you plan out your wardrobe. I will then coordinate your individual looks and shoot locations so everything is cohesive and gorgeous! Once you're camera ready, we'll begin your photo shoot that will last 2-3 hours. I'll guide you and show you how to pose - don't worry about that at all! We'll visit unlimited locations so that you will have a large variety of exclusive looks to choose from. 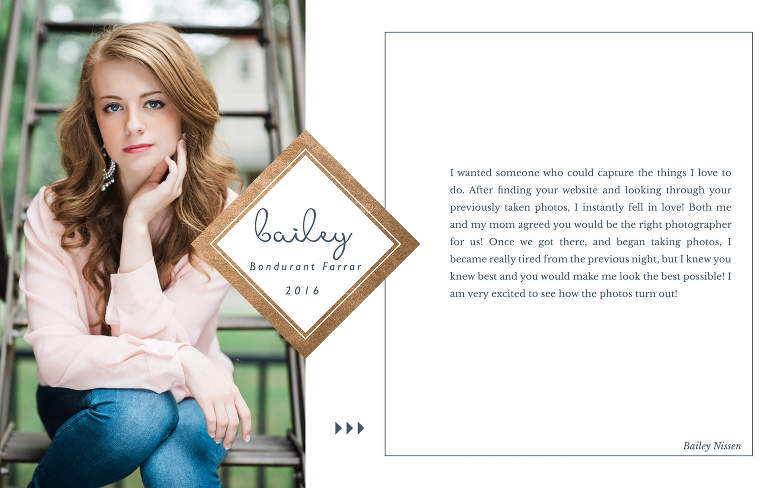 Every senior session is a little bit different, and yours will be just perfect for YOU. Your session will be so much fun - you'll love it, I promise! $400The ultimate experience! This session is where we make your dreams happen! This shoot includes multiple locations and looks. Two hours of “regular” senior portraits, plus additional time for concept shoots, cars, sports, or evening shooting. We recommend this session for seniors who want lots of variety, have out of the way locations in mind, or are truly excited about doing creative lighting shots for sports. $300This session is all you’ve dreamed of – professional hair and make-up so you look absolutely fabulous. This is our most popular session with senior girls because it is really the perfect length of session shooting time, and you get that little extra bit of pampering. Guys, you can choose this session if you’d like a bit more shooting time and have some stylized sports photos in mind. We’ll give you a print credit towards your final order in lieu of hair and make up. $150This session is held locally in town in Grinnell, the perfect session for seniors who want the JWP signature style but may have a smaller budget.. You can expect 3-4 outfits for this session. This is our most popular session for guys. Your senior year is unforgettable. We believe your senior portraits shouldn't be any different. Do you want to be a #jwpSenior and have an unforgettable experience? 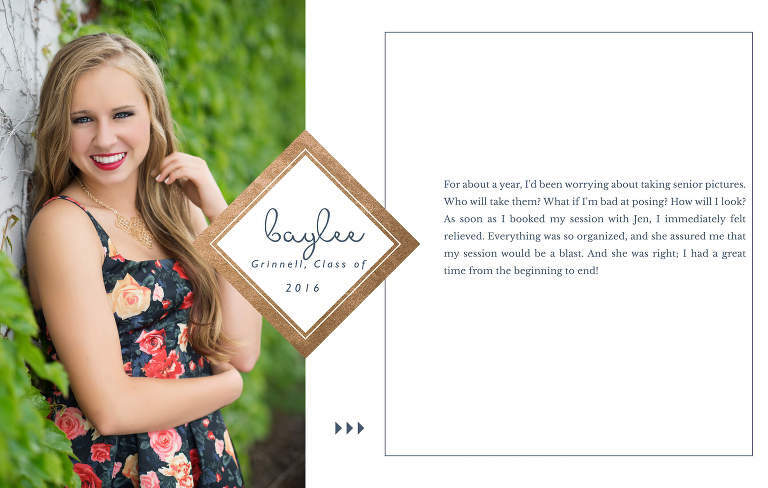 We book a limited number of senior sessions each year. We work with no more than 30 seniors annually because it is important to us to work with the RIGHT seniors, and they with us. We would love to hear more about you and your ideas for your session! Fill out the contact form and we will be in touch with you as soon as possible. WHEN SHOULD I CONTACT YOU TO BOOK MY SESSION? Early. I focus on giving each senior a fabulous experience, therefore I limit the number of sessions available each month. Therefore, my calendar fills up fast. Typically, I am booked 2-3 months in advance, but it depends on the time of year. Weekends are popular, though limited due to weddings. Therefore, to reserve your date, call early! I have had people reserve their session as far as a year in advance, and that is great! A few tips: while mornings aren’t everyone’s favorite, this is a great time for portraits because the light is beautiful! Summer mornings are also cooler as well. Fall dates fill fast, with peak leaf color being the last week of September usually. WHY DO YOU LIMIT THE NUMBER OF SESSIONS YOU PHOTOGRAPH? I love offering a unique experience where you feel special. In order to provide this service, it requires additional time. I will research locations, put together outfit inspiration boards, respond to emails, design custom albums and cards, etc. there is a lot of attention given to each senior and their session. This helps me build great relationships with each client and their family! By the time you receive your final order, we will be like old friends! And this is exactly how I like it. You won’t be just another person waiting around for your studio time. You will be the most important, and most likely the only, senior I photograph that day! CAN I BRING FRIENDS OR FAMILY TO MY SESSION? Oh my goodness, YES! In fact, I highly recommend it. Your best friend, sister, mom, boyfriend – bring them all! Your friends will put you at ease, and they will have a fun time too. Just keep in mind that I don’t allow additional cameras at your session, other than that, the more the merrier! If you’d like to include friends or family in any of your photos, please let me know ahead of time. I’m more than happy to accommodate, though keep in mind that this is still your senior photos. If you’d like more than 1-2 finished family or group portraits, then we should have a separate family or group session. This varies with each session and will depend on your preferences and wardrobe selections. If you have locations you want to try, please let me know ahead of time! I have a variety of places that I know will look amazing, but I’m always up for something new! We can do urban, grungy, country, more refined, simple, water, sports locations, parks…even your back yard! WHAT CLOTHING CAN I BRING? Bring a mix of looks, and I can help you put together great outfits. The more you bring, the better! Many seniors email or text me photos of their outfits ahead of time, which is fabulous. If you have specific questions about wardrobe, I am more than happy to help before your session. You’ll also receive tips and links to inspiration to get you thinking about what might work well for your senior portraits. WHEN DO I SEE MY PHOTOS AFTER MY SESSION? DO I GET A PROOF BOOK? After your session, I will post a sneak peek on my Facebook page typically within 48 hours. This is just a teaser! The rest of your images will be finished after I hand edit and retouch each one. This takes about 2-4 weeks after your session. At that time, we will have your premier ordering appointment at my home studio. 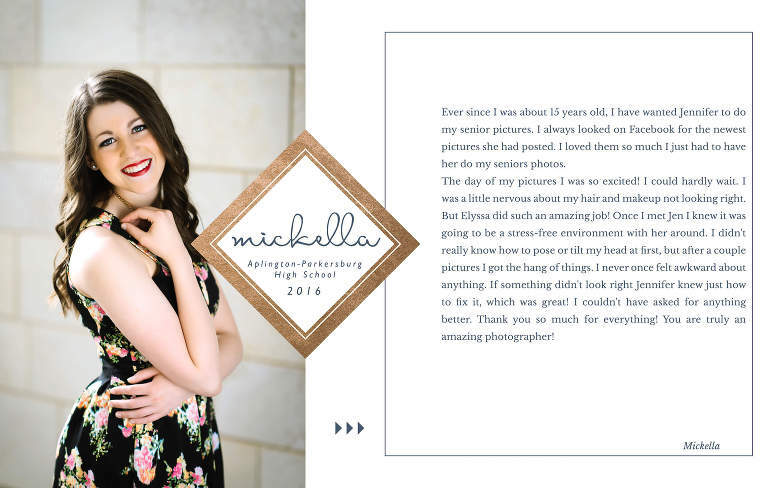 You’ll view all of your images, check out the gorgeous products available, and finalize your product order and yearbook photo at this time. I do not offer printed proofs or proof books to take home. WHAT ABOUT MY AUNT OR GRANDMA THAT CAN'T MAKE IT TO THE ORDERING APPOINTMENT? I receive this question quite a bit. My recommendation is to make selections for your extended family on their behalf. This simplifies the process greatly, and chances are your extended family is just as busy as you are, so you’re saving them time! If you’d prefer for them to place their own order, I’m happy to organize a complimentary online gallery of your selected images posted after your ordering appointment for 7 days from which they may place their order directly. Everything from traditional prints to the latest in acrylic wall art, gallery wraps, storyboards, beautiful albums, custom cards, books, and everything in between! If you’d like to see my full product list and pricing, please contact me! Do you sell the USB? I’d like all of them please! Yes, I do offer a digital collection! It is one of my most popular collections because you truly get it ALL! The digital collection includes a beautiful image box with a 5×7 of every single image from your session, plus a USB containing each high resolution image, plus a web sized image. It comes with a print release as well. The full digital collections is $1500 and is one of the most popular products we sell. WHEN WILL MY PRODUCTS BE READY FOR ME TO PICK UP? Custom designed albums, books, cards take additional design and production time. You can expect albums to be ready 4-6 weeks after design is finalized. Prints, gallery wraps, wall art, cards, etc are typically ready in 2-3 weeks. What payment types do you receive? Cash, check, and credit cards are all accepted. We've found over the years that most families order at least $400 worth of senior portrait products, so this is our minimum order requirement. Your minimum order requirement is due at your ordering appointment. Absolutely. We work with many families to offer payment plans. We require a credit card number on file to process payment plans/ Your products will be ready for you when we’ve received your final payment.